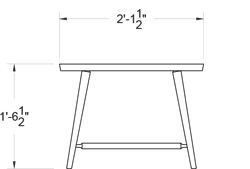 The side table is intended for both the home or institutional environment and is assembled using only joined elements; there are no screws or bolts. A hand shaved spindle shelf below allows for storage or display. The table also comes in a smaller version with a drawer as a bedside table. Features include: hand shaved spindle shelf, turned legs and stretchers, solid, bookmatched top & mortise and wedged through tenon. Custom modifications will be considered. (Shown in Myrtle).